Computes the sum of the image pixel values. On the output outSumColor the sum of pixel values for each channel of an image will be computed. For above example it will be R, G and B components, but it is also possible to use another color spaces. 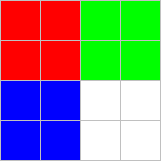 Sum of color for R channel will be: \(4 * 255 + 4 * 255 = 2040\) - sum of four red pixels and four red-components from white pixels. Finally, the result for above example will be 1x4 dimensional vector [2040, 2040, 2040, 0]. Notice, that zero is present in result vector, because RGB color space has only three components. When only a part of an image should be processed use inRoi input to specify region of interest.